January 28th, 2016, will be the seventeen-year anniversary of the virtual pet-open world game Digimon World. In the time since its original launch, tamers around the globe have been baffled by one secret that seemed destined to never be unlocked. Digimon World has a fully functional Metal Etemon programmed into it as a Perfect-level Digimon, complete with a full list of learnable techniques, VS mode sprite, and a working finishing move. Yet Metal Etemon doesn't evolve naturally from any Digimon in the game, and his specific evolution item "Metal Banana" can't be obtained without hacking. This Etemon variant isn't necessary to complete the evolution chart, or to earn the Digimon Master medal. Functionally Metal Etemon is a Vaccine-attribute reskin of the original Etemon, sharing his Dark Network finisher and movepool, and if the player evolves to Metal Etemon before unlocking Etemon via a hacking device then the Metal variant will take Etemon's place on the evolution chart. Etemon's skin compared to Metal Etemon's. Note the sunglasses and nut & bolt pattern. On the Japanese side of the Pacific rumors have pervaded message boards, Q&A pages, and fansites alike for years that tamers could evolve their partner into Metal Etemon by lining up the roulette wheels while doing waterfall training at the Green Gym. The rumors were fueled by Metal Etemon's appearance in Digital Card Battle, where the Green Gym waterfall was the background image for his trading card. 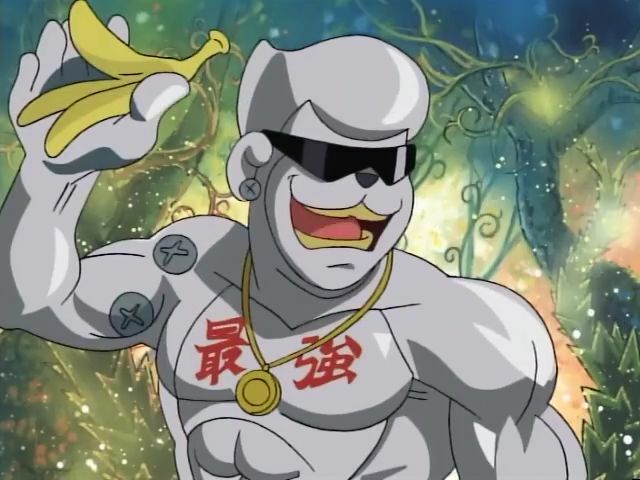 On the American side, various methods of obtaining the Metal Banana like buying it from Etemon's shop after purchasing fifteen to twenty-five Golden Bananas, or it having a probability between .01% and 5% to appear randomly in his shop have been circulated but never substantiated with images. Speculation and investigation has continued for so long in part because of how many new things are discovered about Digimon World from year to year--most famously, the exact evolution criteria for Heracle Kabuterimon were only discovered in 2011 by Orange Fluffy Sheep & MechaBread, and in 2013 Chain Melons were confirmed to spawn in Gear Savana for the first time. Official guides have been notoriously unreliable. Even some of the most recent efforts to create a dedicated game modification tool for Digimon World by veteran Digimon hacker Romsstar have turned up no secret methods of unlocking the Metal Banana. It seemed as though this was just one element of the game not implemented for unknown reasons, fully complete and still dummied out. But on one long-neglected corner of the internet, an answer has lied waiting for many years. Memory cards containing ultra-rare Metal Etemon data for the PlayStation Software Digimon World were given out as presents, among other things. There you have it. Metal Etemon was at one time legitimately available in the Japanese Digimon World; but rather than being available through traditional evolution or an obtainable item, he was akin to an event Pokémon like Mew. Tamers had to get the Metal Banana item from one of the original distribution memory cards, or copy the data from a friend's card. VTR doesn't list where the memory cards were given out, but one other source has corroborated V-Tamer's information and provided an explanation of how the memory cards were given out. 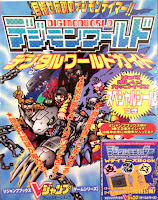 According to an anonymous user posting on the Japanese-language message board 2channel back in 2006, Metal Etemon was originally a raffle prize given away in V Jump's guide for the game (pictured at right). Raffles of this type are very common in Japanse children's franchises; presumably fans that purchased the guide would mail in an attached slip to get one of the memory cards. The mystery does go a little deeper than this, however. Metal Etemon was not the only missing secret in Digimon World. The existence of Metal Etemon, Gigadramon, and "Saber Leomon" was seriously doubted by fans unable to replicate the rumors, and as the years have worn on more recent walkthroughs and FAQs dropped their names entirely, not even making reference to the Metal Banana, Giga Hand, and Noble Mane evolution items. The Digimon (barring Saber Leomon) do exist, taking up the slots in the game's data structure immediately after the last normal Digimon (Mega Seadramon) but before the arena-exclusive Vamdemon and NPC/enemy-only Digimon. Panjyamon's and Gigadramon's level of completion is much greater than that of Were Garurumon; since they're reskins of existing Digimon, these two aren't missing field animations in the way that Brachiomon or Mugendramon are. While no source has confirmed this, based on Metal Etemon's historical role it's likely that all three Digimon were at one time intended to be given away as prizes. The promotional status of the three Digimon makes sense, considering their relationship to their counterparts in the game; Metal Etemon (Vaccine), Panjyamon (Data), and Gigadramon (Data) differ from Etemon (Virus), Leomon (Vaccine), and Megadramon (Virus) only in their skins and attributes, with identical techlists and finish commands. There's nothing setting them apart from the originals aside from visual appearance and the areas they can access--which is the perfect kind of limited time promotion for a game like Digimon World, that had a multiplayer component where tamers would show off the Digimon they raised. Actually Vamdemon has a full skillset and as such you can use him for fighting as well after making some small adjustments. I was going to release a complete spawn guide (with images) since I got access to the whole data but then Redigitize happened and since then I got rarely any time to work on DW1. For Metaletemons shop I have the data which shows which shop sells what and there's just no pointer where anything you do could trigger that. But I'll eventually release a patch for DW1, where people will be able to obtain these three items (Giga Hand, Metal Banana and Noble Mane), legally within the game. either as super rare spawns or perhaps some special event where you can buy it from the item shop. That's really interesting. Vamdemon doesn't have field animations for pooping/feeding though, right? Alas just like with Mugendramon he lacks those animations as well, leading ultimately to them getting stuck in a loop when that happens. To this day I wasn't able to figure out the complete Animation format. That is really the only thing that's not figured out yet. Once I do I could add dummies to those animations or even add real ones and we could play with any Digimon we want. We know everything else (though I didn't make everything public yet). I'm not perfectly sure anymore but I think the attributes were really only used for the Sanctuary, the Mansion and those other areas. But it's been a while. I will have to look into it again. Great article. This blog is always filled with great reads. You should make an article about Digimon World's history of findings. The link's broken, but I wonder if that's the same site I saw. I actually recall spotting that little bit of info a good while back. On a similar note, I found out that the WonderSwan Color game Brave Tamer also had a promotional giveaway for something otherwise unobtainable. This one was for a Beelzebumon Blast Mode chip, which would allow an equipped Digimon to use its Chaos Flare technique.